We at Bugsy's Rooter & Drain Cleaning know that You,The Customer, come first and that we are here to help you! Bugsy's Rooter & Drain Cleaning utilizes only the most up to date methods and drain cleaning equipment available. We have helped hundreds of families! Slow drains/stopped drains, clogged kitchen sinks, clogged shower drains, clogged bathtubs or sewer backups Let Us Help You! Bugsy's Rooter & Drain Cleaning, has been proudly serving Westfield, Cranford, Union, Garwood, Kenilworth, Scotch Plains, Fanwood, Summit, Springfield, Millburn, Roselle Park and Short Hills, New Jersey for over 12 years. 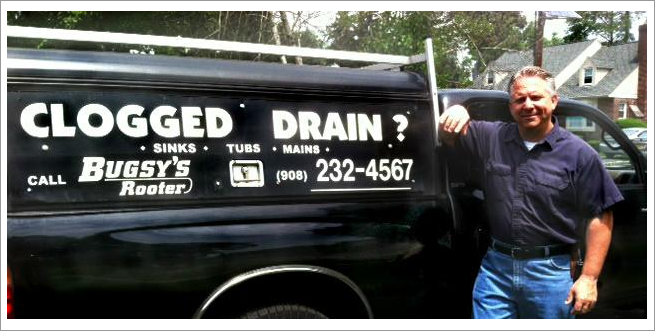 When you need a drain cleaner Call Bugsy's Rooter & Drain Cleaning! "We Are Your LOCAL Sewer & Drain Service"
Company history: Bugsy's Rooter & Drain cleaning has been PROUDLY SERVING UNION COUNTY for 12 years. My prior sewer & drain experience, includes working for the 'well known' other rooter people as well as various plumbing contractors. We have seen our share of sewer stoppages and clogged drains. The reason that I got involved in this business is because I was once the CUSTOMER in need of this service. Copyright 2012 Bugsy's Rooter. All Rights Reserved.